So why is it all so important to us that France survive? The penny began to drop for me when I paid my first visit to Fontgombault Abbey in about 1984 or 5. It was late December, and there were some very hardy scouts in their blue uniforms camping in the grounds. Several of them would attend every office in the freezing church, dressed only in their uniforms (shorts!) without even a jacket. A few even came to Matins, long before dawn. What struck me most forcibly was the devout way these teenagers made the sign of the cross; not the hasty dabs made by other nations, but a slow, reverent, deliberate and beautiful gesture. It seems that France is a country where it is very hard to do anything half-heartedly; its extremes are very important and held to tenaciously. Again, at Fontgombault, I was struck by the fact that in the monastery there were then at least sixty priests. But in the village, quarter of a mile from the monastery gates, there was a parish church which had to share a single priest with umpteen other churches. It would not occur to the monks for one minute to celebrate Mass for the parish, nor would it occur to more than one or two of the parishioners to attend one of the vast array of daily Masses in the Abbey. The secular priesthood is in a bad way in many parts of France, but the monasteries, not just the traditional ones, are thriving. In other words, in France you can certainly find the worst, and the worst is very bad. But you can also find the best, and the best is really wonderful. And there are always surprises. Take Paris, for instance. Given the nature of a capital city, and the state of the faith outside, in, say, the diocese of Sens-Auxerre, one might assume that the faith in Paris would be in pretty bad shape. But not at all; in fact, the diocese of Paris would appear to flourish enviably. I hear that the seminaries are doing relatively well. New movements exist here and there and keep the prayer life going. I visited Paris a few weeks ago, and each Mass I attended, including on weekdays, there was a substantial congregation. I never saw rubrics violated; priests were properly vested and said Mass devoutly. I saw extraordinary ministers of Holy Communion at Notre Dame, ( the congregation was huge and in terms of Canon Law their use might be said to be justified); the ministers were all men, wore suits and ties and behaved very properly and reverently. The only disedifying thing I saw was at Sacre-Coeur; a worshipper had presented him or herself at Communion time and asked the priest for a blessing instead of Communion. Well, the priest indignantly refused and, holding the Blessed Sacrament, roundly told the person off. Then, before giving the blessing, he went off on one (as my secretary would say) and harangued us all saying that if we weren't fit to receive Communion, we shouldn't be in church at all, that we polluted the very air with our foul sinful breath. It was really dreadful, and I felt deeply for the poor individual who had inadvertently sparked off this intemperate diatribe. My ear for French accents isn't that great, but I think the priest might have been Polish. The highlight of my visit to Paris was unquestionably the feast of the Assumption. 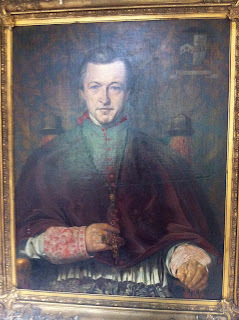 I attended Mass at Notre Dame, celebrated by Cardinal Ouellet. The music was Gregorian chant sung by a small (unsatisfactorily amplified) schola, who took the modern Marcel Pérès approach. It was very effective. Everything was done splendidly and, to my great surprise there were two (two!) processions in honour of our Lady on each evening; on the eve of the feast by boat around the islands, and a walking procession on the day itself. There were huge crowds participating—again to my edification and surprise. There is a serious sense of purpose in the French Church; at one time I used to say that France was in a bad way, but the pilot light is still lit. In many parts of the country that is true, but I think that one can now find many places where the faith is very strong indeed. The Traditionalist corner is powerful and punches well above its weight, but it is not really very big (though bigger than in other countries). There is a lot of other good stuff, too (as in some of these new movements). It will take time to develop, but I think we can see something of the programme for the Church's recovery beginning to emerge above all in France. I know very well that France still has massive problems with too few (and sometimes unbelieving) clergy, hopeless bishops, lacklustre liturgies, dying active orders of religious, arrogant modernists and the rest. But there is a great deal of energy, too; it just does not tend to be linked up with the hierarchy yet. Sooner or later, the hierarchy are going to realise that it is in these otherwise despised groups that all the future of the Church is to be found. And then it will have to come to terms with them. But they are very strong, and because of this gallic love of polarised and strong positions, they will put off the evil day for as long as possible. And meanwhile the Fontgombaults, the Communities of Jerusalem, the Communities of St Jean and the like will continue to grow and send out foundations as in the past. We need something like this in the British Isles, but without that indomitable spirit that the French have, I doubt we will achieve it. 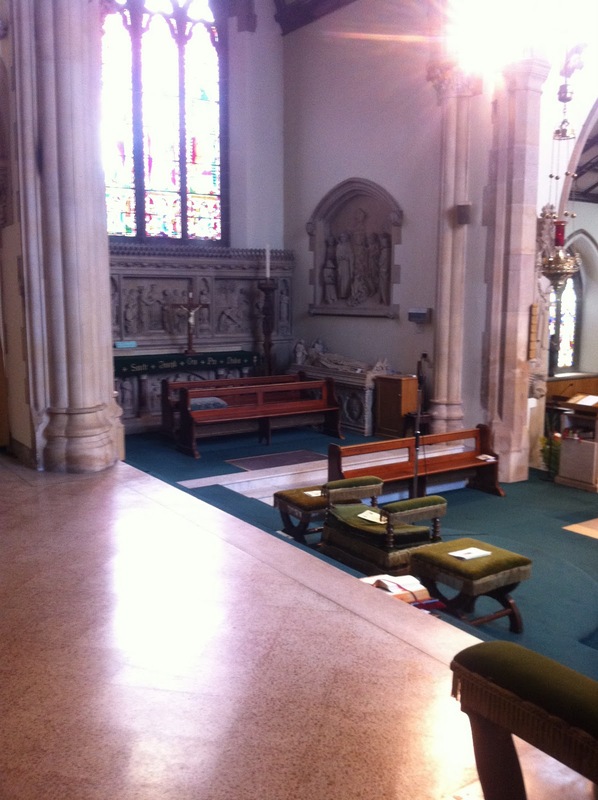 The community of St John have already made a foundation in London. Its methods are unlikely to transfer to the English, any more than happened in the past; but their presence is very welcome and may truly inspire some good growth in this land. You see, il faut que la France survive! Stone, in Staffordshire, has connections with two holy men, both called Dominic. The first was Blessed Dominic Barberi, who opened a small mission here—and on one occasion got stoned. People threw stones at him, I mean. Not the other thing. The little chapel he built still stands, and some years ago I was privileged to celebrate Mass there. 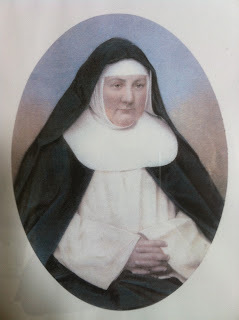 St Dominic is the other great Dominic; the remarkable Mother Margaret Hallahan established the first active Dominican sisters in Britain at Stone, which is now the mother house for the Congregation of St Catherine of Siena. 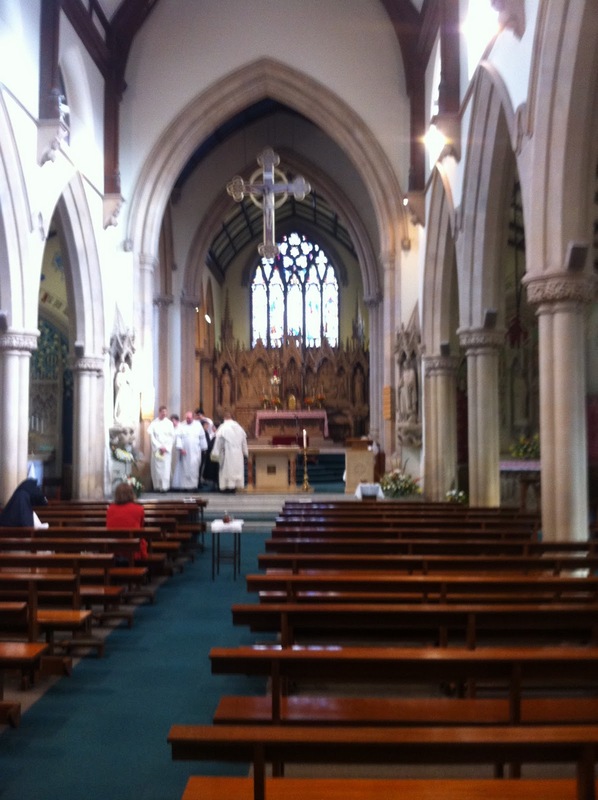 It has a marvellous church, which it shares with the parish, and the sisters run a school and a nursing home. which may account for their similarity in appearance. at the altar end of the choir. 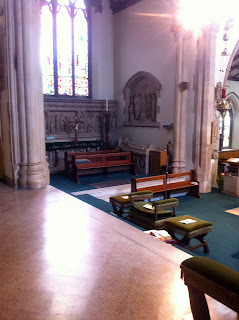 Long view with some Dominican friars who kindly offered some atmosphere. community. 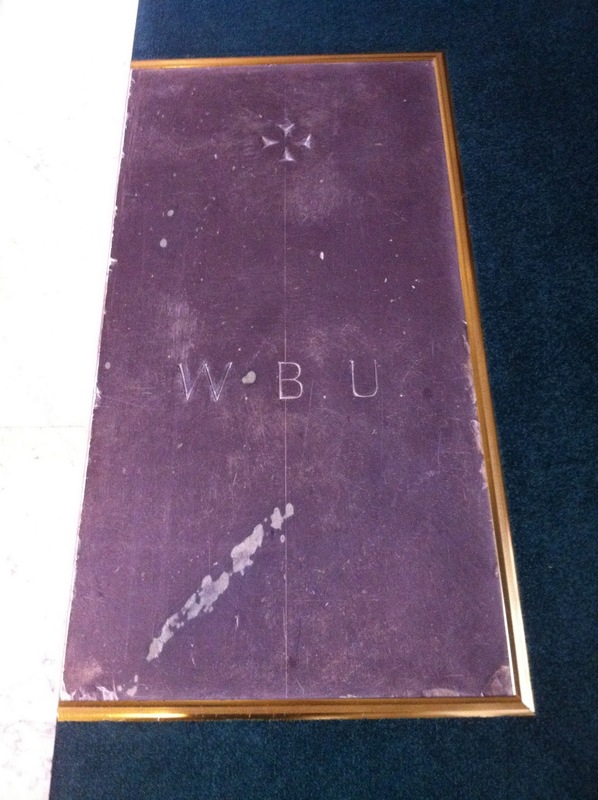 He, too, is buried with great simplicity in the church. Some time I must do a post on this extraordinary man. 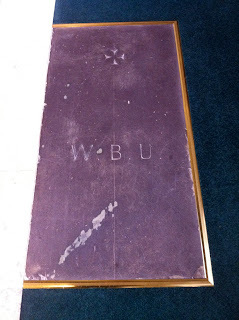 His simple tomb (below) is in the floor of this chapel, there being also an effigy against the wall. Perhaps the effigy used to stand over the grave slab. The cloister is a full one; the only remaining Dominican full cloister in this country, somebody told me. On Saturday I drove a long way; to Stone in Staffordshire and back for the Solemn Religious Profession of Sister Ann Catherine Swailes as a Dominican sister. It was my privilege to have prepared and received Sister Ann into the Church some years ago, and so the Profession was a very special occasion for me. and, a rather blurred after-picture. 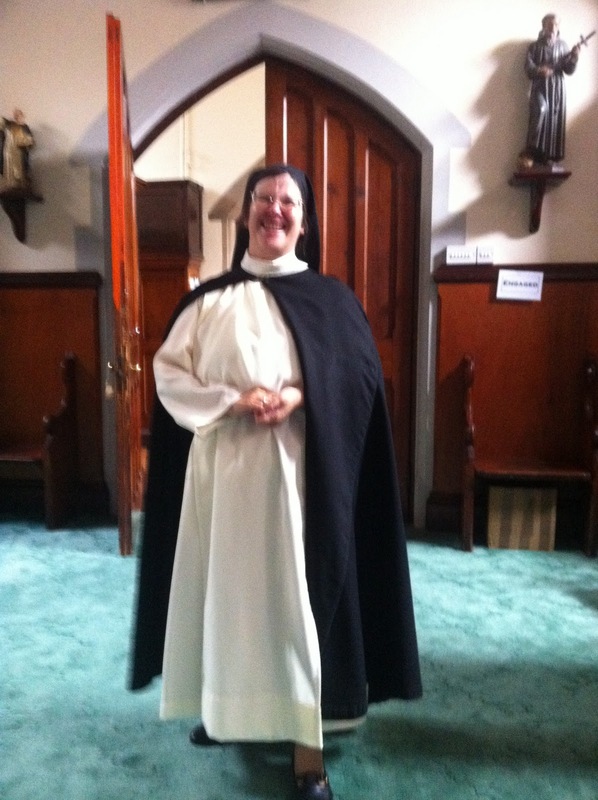 Many congratulations to Sister Ann Catherine. Ad multos annos! I'm sorry this has come late, but I have had a very, no frantically, busy week. Celebrating Mass this morning, I found myself stumbling again and again with the new translation, microphones &c, and preaching very lack-lustredly. But I can't let one incident go by entirely without comment. Fr Ray Blake, who is one of my dearest friends, has been sent a most unpleasant communication, accusing him, essentially, of inciting hatred and bigotry against gay people on his blog, and, essentially, threatening him with a scandal by involving his (and my) superiors. 'Hatred' and 'Bigotry' are words often used by secularists about religious people. It is such a strange comment to make. Now I think that one does encounter it among some Christians in some places; I understand that in some places in the United States certain Protestant Christians feel it their duty to display signs saying 'God hates fags' and similar things. Never, ever, have I heard or seen anything of the sort from a Catholic, however opinionated. And never, ever, have I heard or seen anything of the sort from any Christian, Protestant or Catholic, in this country. I'm not saying these have never happened; only that I have never witnessed them. God hates nobody. God hates nothing that he has made. God loves gays, lesbians, even Richard Dawkins. Even me, which is really a miracle of tolerance. Thinking, even writing, that gay people might be better off being continent if they wish to live the full Christian life may be disagreed with, but slinging around cheap accusations of bigotry does nothing even for the gay cause, if truth is what they are after. And this is as true for Christians as for Stonewall. We live in a multicultural society, and we have to rub along with all sorts of ways of life that we think are less than ideal. It's part of being human. But if certain members of the gay community demand tolerance and understanding, then they have to show it to others also. They demand we understand them; they must try and understand us, and not base their accusations on caricatures of what they think we believe. Messa in Latino has posted what he believes to be the content of now famous Preamble given to the Society of St Pius X to sign. Essentially, he says, there are two points. The second point is simple; the Society must change its tone and become more respectful to legitimately constituted authority. The first expands on the different sorts of adherence that a Catholic must give to different degrees of Church teaching, as expressed in Canon 750 and the Apostolic Letter Ad Fidem Tuendam of Pope John Paul II. Solemn teachings of the Church, proclaimed to be divinely revealed, must be adhered to with firm faith; nobody in the SSPX is going to quarrel with that. Bishop Fellay instanced our belief in the Trinity as an example. Then there are the dogmas that are not explicitly in scripture, but which the Church has taught consistently or else proclaimed dogmatically; for instance the impossibility of the ordination of women or the wrongfulness of Euthanasia. Here too the SSPX is not expected to disagree. The third degree, however, regards the non-definitive teachings of the Magisterium of the Pope or College of Bishops, especially where there has been some degree of change, for example over the issue of usury. Since the Council explicitly (in the words of Pope John XXIII, if not Paul VI also) said that it wanted to define no new dogma, and though it makes assertions, they do not have a dogmatic nature of themselves, one may be cut a certain amount of slack. As the official communique of the Holy See reported, the Preamble left 'theological study and explanation of particular expressions and formulations present in the texts of the Second Vatican Council and of the Magisterium that followed it open to legitimate discussion.' It should be noted that the object of this discussion, which is expressly termed 'legitimate', is not only about the interpretation of documents, but of the text itself of the documents: the 'expressions and formulations' used in the Council documents. So we are well beyond mere hermeneutics; it has become permissible to scrutinize the words themselves (and not only the significance or interpretation of those words) which the Council Fathers chose when putting together the documents. If the words used in the preamble and so in the official communique have a meaning, here we have a Copernican revolution in the approach to the Council. That is, a move from a mere exegetical level to a substantial one.… In his discourse of the 15th August, Bishop Fellay said that for Rome the Council was taboo, and therefore one was limited to the discussion of the external wrappings, that is of interpretation. Now, on the other hand, it is permissible to tackle also the heart of the matter. This implies furthermore that the controversial passages, insofar as they may be freely discussed, do not even demand that lesser degree of acceptance described as 'religious submission'. Having said Mass, I've now reworked the translation, and I hope that it is clearer.Thanks to Eriugena for help with a mystery word! Well, we must wait and see. But we live in interesting times. I don't think The Tablet is going to like this one! Have you ever flown with RyanAir? I don't recommend the experience. But I do recommend this musical meditation on the subject. Warning: if you don't like (even justifiable) strong language, don't press play! An interesting and, I think, enlightening comment from Jeremy Hardy on this week's news quiz (this link will expire on 23 September). Regarding the total failure of the Large Hadron Collider to find any Higgs Bosons (my theory being that it's a bit too small for them to see) Jeremy Hardy remarks that it's this kind of thing which causes a higher proportion of physicists to believe in God and therefore incidentally makes physics not a "real science". After all, he remarks, we know chemistry works because we've got Boots. Although I suspect he's ignoring the existence of the Boots homoeopathic range. But Jeremy Hardy rightly points out that physicists eventually have that end point in their research. At the Big Bang - or even if they work out what was before it - at the Higgs Boson - or anything smaller - or whatever they decide may exist instead of it to give us all mass - at some point they're going to have to shrug their shoulders and say "maybe God did it." 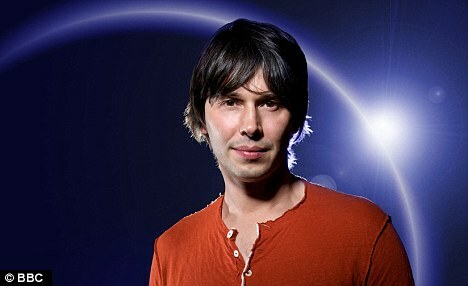 Maybe not Brian Cox, of course - who seems to believe in analternative higher being. And that has certainly been my experience. The proper scientists I've known - physicists, theoretical chemists, even biochemists - seemed to have average or even above-average levels of religious belief. Not fundie 6-day-creation religion, because by definition these people can think clearly. But they certainly often have faith. Whereas the soft-scientists and almost-scientists - zoologists, economists, computer scientists - they don't. And I suspect it comes down to your priorities. Physicists and theoretical chemists are interested in truth and facts and mad stuff like that. Whereas zoologists are into fluffy bunnies, economists think human beings can actually control this world in some meaningful way and computer scientists just got into it because they thought it was a way to meet girls. If the particle physicists have really spent about £3Bn of our money - that's 3-followed-by-11-zeroes pence, as Brian Cox would tell us - in an attempt to find something that doesn't exist, that's got to be an act of faith that outstrips the Oxford Martyrs, Christopher Columbus trying to find the Indies by sailing west, and even people tuning into Big Brother thinking it might be better this year. And what a waste of money - grief, £3Bn could have bailed Greece out for nearly a fortnight. But maybe, as Prof Brian would tell us, the basket-case Euro-zone countries will always be with us. Whereas the Large Hadron Collider will be quietly re-opened as a fairground ride in two years' time, and we'll forget what it was ever meant to be for. And so we find ourselves in the twentieth century. Those secularists, in particular Georges Clemenceau, set their minds firmly against the Church, expelling many religious orders, several of whom came to England and did wonderful work. The Grande Chartreuse, having scented trouble, built the great Charterhouse of Parkminster in West Sussex, just in case (though I don't think it ever actually moved there). 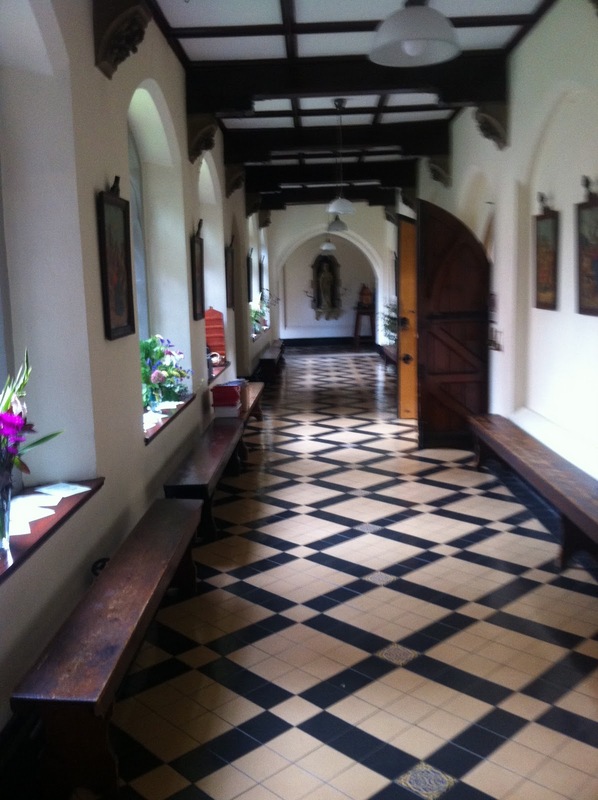 The Solesmes Benedictines founded Quarr on the Isle of Wight, and actually did live there for several years. And many orders of women came too and founded schools where they insisted on teaching in French, not English, and this chauvinistic impulse made many Catholic Englishwomen bilingual, to their, and their country's, benefit. Clemenceau was every inch a child of the revolution. After the devastation of the First World War (in which France suffered truly appalling losses) he set about building a new Europe. In this he was assisted by Woodrow Wilson, the president of the USA, who was determined to 'get rid of all those old Kings' (or something like that). No doubt the idea was that it was precisely this old alliance of throne and altar which had led to monarchs being able to devastate their own and others' countries for some abstract notion of glory. Gott mit uns was a common notion on all sides, and it probably was a major contributor to the advance of secularism. For the French, the gulf deepened between those who held to the old vision, and the secularists. Come the nineteen-fifties, there was a great division in French society; the Church and the integrists on one side, and the workers and secularists on the other. Everyone knew that something had to be done to heal this wound, and it was as a result of this that the Worker Priest movement was born. The Church reached across the gulf to embrace the working world and, some would say, was making progress. And then Vatican II happened. It seemed that the Church herself had leapt that gulf, and in 1968 embraced the working people. The windows had been opened and the world and the Church were joined once more. The whole aesthetic of the Church was no longer elitist and separatist, but vernacular in every sense, of the people. Priests abandoned the soutane and embraced the grey suit and blue polo shirt. Choirs were dismissed, and the people would do the singing. The trouble is that the average workman wasn't that more attracted to this than to what went before. In fact, probably less. He was not convinced that the Church had anything to say to him, and certainly he wasn't impressed by a priest who didn't dress like one, who clearly didn't have the courage of his convictions. (a) France has a mission for the Church and the world. (b) France is the eldest daughter of the Church, and has an eldest daughter's privileges and responsibilities to teach her younger siblings. (c) France is a loyal daughter of the Roman Church, but not her slave. (d) The appalling division within French society is the work of the devil who seeks to strike just where it is most crucial that there be unity. It is France's greatest shame, and the Revolution is the greatest manifestation of this shame. The perpetuation of the celebration of the Revolution (July 14th and all that) is rubbing salt in the wound. 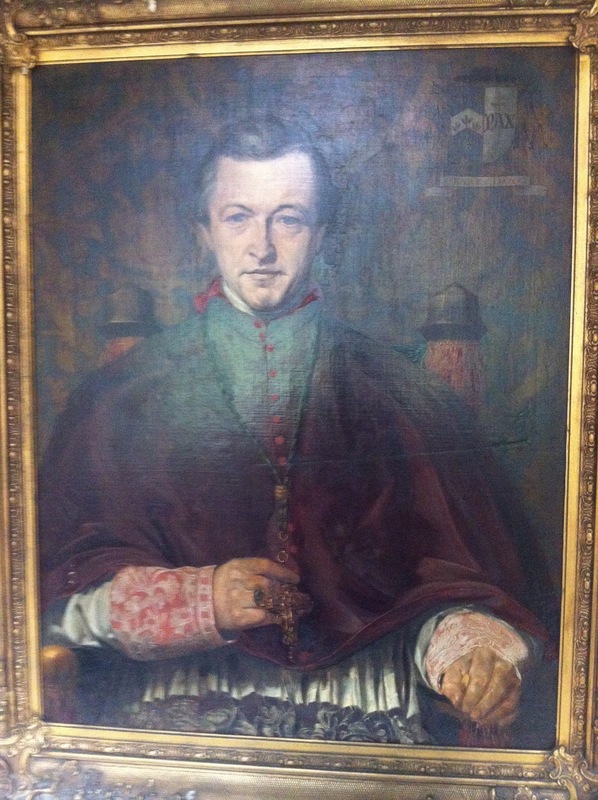 And hence the insistence of the Society of St Pius X and its co-runners that it has never ceased to be Catholic; rather it is doing its best to make the rest of the Church properly Catholic. One does not need to obey the Pope's sillier decrees to be a proper Catholic, in other words. There is more than simple blind obedience. Within France, the trouble is that the Integrists have not really found a message that will speak to the masses. Le Pen and his political cronies are willing to use the Integrists, but they are not Integrists themselves. They lay on the Old Mass for their supporters, recognizing that there are a lot of committed Integrists who might well vote for them, but it is really just a flag of convenience. They can speak to the masses, but their message is about immigration and all those other things familiar to our own National Front. They are as republican as the other parties, in effect. The alliance between the Integrist Catholics and the Front Nationale is at best an alliance of convenience; the two in reality have very little in common except conservatism, of a sort. So what holds this riven France together? Simply, the notion of being French. In all the troubles that beset that fascinating country, every party has been intensely proud of being French. They have disagreed about almost everything else, to the point of copious bloodshed, but the spirit of Clovis and his Franks is still alive to that extent. All of them agree that France is, simply, THE country to live in. It is, to them, self-evident. They have none of that irritating smugness of the Italians about Italy; it is simply self-evident to every intelligent person that France is the best. And that is why, to them, il faut que la France survive. In one more post, I'd like to look at why it is necessary for the rest of the world, for us, that France survive. Discomfiting faith of the young? Among some good coverage of World Youth Day I was surprised to read in Robert Mickens' 'Letter from Madrid' (27 August) remarks that implied that pilgrims had 'provoked' protesters by praying the Rosary. We must act in Christian charity, but this does not require us to hide the truth. While there may have been 'provocation' on the part of pilgrims, there was revolting conduct on the part of some protesters, which was not reported at all in Robert's letter. Is it true that for an older generation we are simply discomfited by the very real faith of the young and wish they would join us bickering over the new Missal? I don't know if you have ever seen the film Cristo é fermato á Eboli? It was a bit how I felt in 2005 when I was appointed to be the Pastor to the Valle Adurni. This morning, celebrating Mass for the first time for a year in the main church of the parish, I put the Blessed Sacrament in the hands of a teenager, into the same place that I had put the same Lord for the first time some six or seven years ago. And I saw a rosary ring there on her finger. I wept. I hope nobody noticed, though my sight was rather blurred for the rest of the Communion line. These moments make every moment of being a priest, all the annoyances and difficulties, worth while. The big news this week is, of course, the new translation of the Mass which begins today. There are few who like change, especially in the way we pray, and we have been using the now-past translation since 1975, most of a lifetime for most of us. Fr Dominic [the priest who kindly supplied my absence when I was on sabbatical] tells me that he has thoroughly gone through all the changes with you, so that it won’t be necessary to say anything further, but of course I am at your disposal as always, and if I can add anything, I will gladly do so. Because of our natural resistance to change, I would ask one favour of you, and that is to hold back on criticism for a few weeks. As you know, I have been living in the seminary for the last year, and there we have been using the new translation since Ash Wednesday. All of us, down to the youngest student, found the transition back into the older translation when we went to parishes far more difficult than our adjustment to the new version. What I am trying to say is that I am confident that when we have all got over the hump of the newness and consequent strangeness of the new version, we will like it better. The prayers are much, much, richer; full of depth and meaning. And if words like ‘consubstantial’ bother you, well consider that if a four-year-old can manage a term like ‘Tyrranosaurus Rex’, a grown-up doesn’t need to only use words of one syllable either. Decisions as to what things might have been translated differently, possibly better—even if we are correct—were never in our gift, so I respectfully suggest that we try not to lower the morale of our parish by grumbling about them. This wouldn’t help anyone, and, I repeat, I am very confident that within a few months almost everyone will feel happy with the new version. Let’s give it a proper try before passing judgement. I think that for a few weeks we shouldn’t attempt to sing the Gloria or Sanctus or Memorial Acclamation, to give us time to acclimatize to the new words. Then we can learn the new music together. Sorry about the strange line-breaks: I'm not sure what happened there! The nineteenth century was probably the most traumatic and confusing period in French history—were you to include the last decade of the eighteenth century, you could remove the 'probably'. Politically, the Empire veered from republic at the beginning, middle and end, two Bonapartist imperial regimes, a Bourbon revival, and a King that tried to be both Bonapartist and Bourbon. Religiously it was a period of revival. Benedictine Monasticism was got going again by the great Guéranger at Solesmes and spread rapidly, with other orders also being founded. There was vast number of instances of a relatively new phenomenon—women's active religious orders, some founded in the wake of the revolution to provide care and instruction to those who needed either, without the constriction of enclosure. It used to be said that even God did not know how many female religious orders there were in France (nor how much money the Franciscans had, nor what a Jesuit was thinking—no doubt there are others). There were saints, too, perhaps outstandingly St Thérèse of Lisieux. The monasticism soon came to be what one thinks of as being 'real' monasticism today. In other words, a community dedicated to contemplation, prayer and plainchant. Guéranger unquestionably thought that he was reviving the monasticism of the Middle Ages, but really I think that French-style monasticism owes more to the Gothic Revival which was just as powerful in France as it was in England. 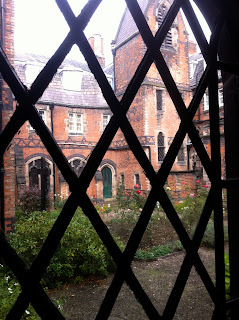 It has long been my view that the English Benedictine Congregation, with its schools and parishes, is closer in spirit to mediæval monasticism than the various French congregations. Be that as it may, revival gothicism caught the spirit of the age more effectively, and Benedictinism flourished. The close of the nineteenth century saw the secularists triumphant. But only just. The Third Republic that followed the Franco-Prussian war and the flight of Napoleon III to the safety of the Home Counties was on the one hand deeply in the hands of the secularists, increasingly dominated by the Freemasons (a much tougher, atheistic, breed than our home-grown kindly-motivated rotarian-writ-large trouser-rollers), but also traumatized by the events of 1870 when, besieged by the Germans, the poor starving people of Paris were driven to eat rats and the rich ate the exhibits from the Paris Zoo, to be followed by the anarchy of the Communards. In the Commune, the Archbishop of Paris was assassinated, and he became a sort of common focus of national angst which meant that the state was kind-of atheistic but with a religious twist. The building of the great basilica of Sacre-Coeur on Montmartre was, in a way, the last flourish of the Ancien Regime, the alliance of throne and altar. In the late seventeenth century St Margaret Mary had given instructions that France was to build a great church in honour of the Sacred Heart, or else terrible tribulations would befall the country. This was later understood to be a prophecy of the Revolution and its attendant horrors. Sacre-Coeur was built with the active co-operation of the civil authorities, and even with a decree of the Assemblee-Nationale in 1910, saying that it was in reparation for the crimes of the Commune. And yet while all this was going on, the arch-mason and secularist Georges Clémenceau was organizing the expulsion of huge numbers of male and female religious from France. 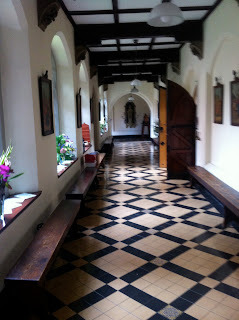 Even Solesmes Abbey was closed, and the monks took refuge on the Isle of Wight, where they lived between 1901 and 1922. So France, then, has this bifurcated understanding of herself: on the one hand profoundly Catholic, and on the other profoundly secular.